Maybe it’s something to do with the soggy Pacific Northwest climate, but there have been a number of bands coming out of the region who play a sort of tribal-psych music. These artists – though each possessing their own unique, identifiable style – are influenced and informed to some degree by at least three factors: the communal, egalitarian hippie aesthetic of the late 60s and early 70s, the super-heavy (some might say plodding) approach of Black Sabbath, and the refined, classically-oriented style of The Moody Blues. Black Mountain from Vancouver BC is at the forefront of this style, but a newer group is showing that they have a unique take on the subgenre. 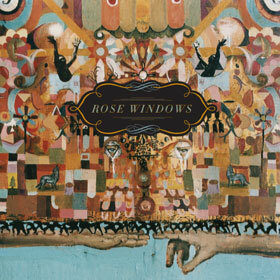 Like the label (Sub Pop) that released their 2013 debut The Sun Dogs, Rose Windows are from Seattle WA. The seven-member group came together in 2010 when founder Chris Cheveyo (guitar and vocals) decided he wanted to move beyond the confines of heavy rock. The band incorporates eastern influences and a gentle touch into a still-pretty-damn-heavy sound. I asked drummer Pat Schowe how that manifests itself in his playing. He says that although he’s been listening lately to a lot of afrobeat such as Fela Kuti, “For my playing, it’s more of a traditional Western rock’n’roll.” So the result is, he says, “a sort of East meets West sort of thing. Chris does a lot of Persian-style scales.” And that blends with the rock rhythm section to “make it special,” he says. That combination introduces the Eastern sounds while not sounding too alien to Western ears unaccustomed to such things. “When some Westerners listen to Eastern music, they get scared,” Schowe laughs. And he laughs again when agreeing that Rose Windows’ music is a sort of gateway drug.